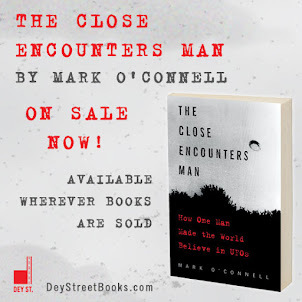 A friend recently asked me if I was including any good UFO photographs in The Close Encounters Man, my biography of Dr. J. Allen Hynek, and I was really sorry that he asked, because I knew my answer was going to disappoint him. As expected, my friend's face fell when he heard my answer. I could tell exactly what he was thinking: No pictures of UFOs? What's the point? So, before he could protest, I explained to him that after 5-plus years of being up to my eyeballs in UFO research and investigation, I had come to the unalterable conclusion that most, if not all, photographs of UFOs are crap. Why do I say this? 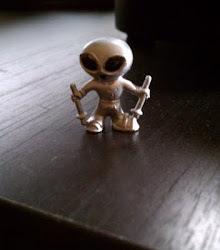 When I was working as a Certified UFO Field Investigator for MUFON from 2011 to 2016, I had many, many people send me photographs of what they had seen in the sky, and mostly what they were were photographs of the sky. In the rare instance that something besides the sky could be discerned, it was just a blob or smear or pinprick of something dark against a light background, or of something light against a dark background. The image on the right is a good example: a black dot in the sky over Lake Michigan, submitted by a UFO witness who really seemed to believe that she had captured something unusual on film. If you blow it up enough, though, the dot looks a lot like a seagull, which it probably is. One series of images submitted by a UFO witness stands out in my memory as having been especially ludicrous. The witness claimed that he stood beside his pickup truck watching as a UFO hovered in the sky a mile away, then zoomed to a spot directly over the pickup, then zoomed back off into the distance, then zoomed back over the truck, then back into the distance, etc., etc., over and over. Fine, but all the photos he submitted only showed the "UFO" when it was a tiny, tiny black dot in a gray sky, seemingly very distant from where he stood. I asked him the obvious question: "Okay, but why didn't you take any pictures when the UFO was directly over you and your truck?" He stumbled and fumbled, as if that thought had never occurred to him, then he said, "Well--it happened too fast!" Of course, if you go through classic old UFO accounts, you're much likely to come across some interesting photos, but many of those -- I'm thinking of the photos of the Phoenix Lights -- aren't a while lot better. And it seems that most of the other classic photos have all been debunked by now. You know what's better than a photo of a UFO? A drawing of a UFO. Or a drawing of a UFO occupant. Not only can you almost always tell exactly what you're looking at, but you can see it as close as possible to the way the witness experienced it. It doesn't matter whether the witness is a good artist or not; if a witness can put pen or pencil to paper and draw what he or she saw, that image is almost always going to contain be far more information, and far more interesting information, than a photo of a blotch of light.